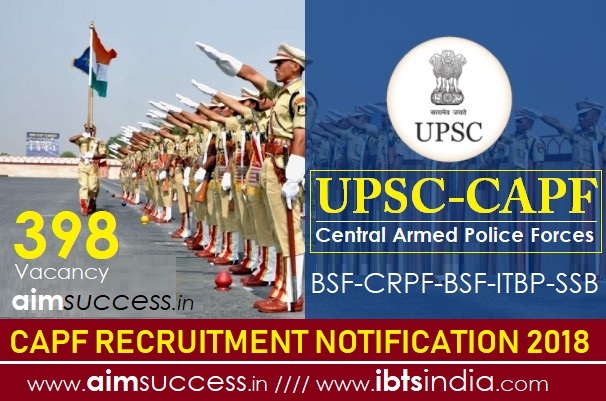 Central Armed Police Forces(CAPF) yesterday released it's notification for the Recruitment of 398 Assistant Commandants(Group A) namely Border Security Force (BSF), Central Reserve Police Force (CRPF), Central Industrial Security Force(CISF), Indo-Tibetan Border Police(ITBP) and Sashastra Seema Bal (SSB). Educational Qualification: Age Limit (as on 01.08.2018): Bachelor Degree in any Stream in Any Recognized University in India. It will be held from 10 a.m. to 12.00 Noon. It will be held from 2.00 p.m. to 5.00 p.m.
NOTE-I : No credit will be given for answers written in a medium other than the one allowed in the Paper. Candidates will be required to indicate the medium of Essay Component in the Attendance Lists and on the Answer Book. No credit will be given for the Essay Component if the candidate indicates a medium on the Attendance List and on the Answer Book other than the one in which he/she has written the Essay. The Interview/Personality Test will carry 150 Marks. Last date for submission of applications: 21st May, 2018 till 6:00 PM. Applications will be accepted only via online mode. To apply online visit the link provided below. Fill the Application Part - I. You will receive a provisional Registration Number. Make sure to note it down and save it. Complete the Part II of application. You can also go to the UPSC Website and apply from there. Click on “Online Application for Various Examination of UPSC”. Click on Part I of Registration for the exam and Follow Steps 1-5.